Rob Johnstone: Dear R., Quit slapping your head and get into the kitchen. 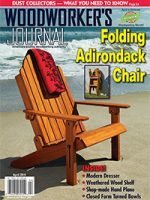 When faced with a nearly identical problem in the February 2014 print issue of Woodworker’s Journal magazine, I dredged some obscure woodworking lore back into the cobweb-infested frontal lobes of my brain. The key here is that your truck flooring is made from oak and oak has a very large amount of tannin in its fibers. The trick I remembered is that if you soak iron-based metal (nails or, better yet, some steel wool) in white vinegar, you create a solution that, if it is applied to wood that has a lot of tannin, will turn the wood black. (Remember those nasty black marks that your pipe clamps made on oak when they were soaking in the puddles of excess glue you squeezed out?) A good bit of the black patina in your lumber likely comes from the tannin in the boards reacting over time. So instead of slapping your forehead, slap some of the solution on your exposed oak edges and watch it turn black. I think you will be impressed.